Love it or hate it, ladies have been wearing makeup for years upon years - often without thinking about what it really is. Before stroking your blush brush along the apples of your cheeks or painting your lips a bright cherry red, do you ever stop to think what exactly the products are comprised of? This is crucial information to consider before completely casting a veil of substances onto your face. Learn about some of the most commonly used makeup ingredients and see if they are things you really want tracing the surface of your skin. A solvent works to dissolve and break down other substances, create a matte texture, and remove excess sebum. Water is by far the most commonly used ingredient in makeup and skincare. It is an important skin component and is essential for proper functioning of skin. If you browse through different products' ingredients lists, more than often you will find that water is the first element listed because it is usually the highest concentrated ingredient. The water used in skincare products is always free of toxins, pollutants, and microbes, meaning it can be catalyzed, deionized, demineralized, distilled, pure spring, or purified. Necessary and versatile, water is generally used as a solvent in cosmetics and personal care products. It dissolves or delivers an abundance of ingredients that benefit skin, such as conditioning agents and cleansing agents, and helps to evenly distribute and disperse product. While working its magic to replenish essential moisture, which is super important considering water makes up the majority of our skin cells, it is processed to eliminate hardness and to avoid product contamination. Water is utilized in almost every makeup product there is, from face to lips to eyes. If you pay close attention, you'll see it listed for foundations, powders, blushes, bronzers, eye shadows, and lipsticks. An abrasive eliminates materials from the body, polishes skin, and improves shine. Silica is a compound composed of silicon and oxygen. This multi-function ingredient most importantly serves as an abrasive, yet also takes on the role of an anticaking agent, bulking agent, opacifying agent, and suspending agent - all the essentials in producing a long-wearing, non-caking makeup product. This ingredient has been named an absorbent because of its ability to absorb sweat and moisture while also preventing light reflection and improving spreadability, a necessity in comprehensive application. It's FDA approved for use as an anticaking agent and works its magic to create a clean, smooth finish. It creates a thicker texture, giving products a good, creamy consistency. Silica is found primarily in blush, mascara, and eye products, as it helps to produce an appealing texture and non-cakey finish. Humectants hold and retain moisture while preventing moisture loss. A sugar molecule found naturally in the skin, Hyaluronic acid is a strong hydrating complex and a key ingredient in many skincare and cosmetic products. It helps to hold water in the skin and allows the epidermis to achieve great suppleness and elasticity. It is a natural moisturizer with excellent water-binding capabilities, making it a superb base. Hyaluronic acid increases skin's moisture content and prevents water loss, helping to ultimately reduce the appearance of fine lines and wrinkles. It maintains the ability to deliver active ingredients like vitamin C to the skin. Use of this specialized ingredient minimizes the need for other lubricants and emollients in a formulation, therefore providing an almost totally greaseless product. It gives skin immediate smoothness to rough skin appearance and significantly improves texture. This powerful ingredient is commonly used in anti-aging preparations for deep hydration, along with cream- and serum-based foundations, blushes, bronzers, and eye shadows. Glycerin, also referred to as Glycerol, is a well-known and widely used humectant in cosmetics and personal care products. It's a colorless or yellow tacky sugar alcohol that is extracted from natural sources or synthesized. It also acts as a solvent due to the fact that it can be easily dissolved in water and alcohol, and is primarily used in skincare for its compatibility with other ingredients. This beneficial ingredient is known for its hydrating, soothing, and healing properties. It deeply moisturizes dry, rough skin while protecting against irritation. It also draws water out from the skin, allowing it to fully breathe and absorb the body's natural oils. Products that contain this component tend to have a refreshing, cooling effect on the skin. Safe and extremely effective, it leaves the skin smooth, supple, and hydrated to perfection. Glycerin serves its purpose by holding pressed colors together for eye shadows, encouraging ease of application in liquid eye colors, and softening the skin in foundation, bronzers, and blushes. An opacifier reduces transparency or translucency of cosmetics. Titanium Dioxide is a nonchemical SPF contributor derived from minerals. This odorless, absorbent ingredient remains on the skin's surface, basically scattering UV light to protect skin from harmful UVA/UVB rays. This all-natural mineral is first and foremost used as a physical sunscreen for both UVA and UVB (broad spectrum). It can be combined with synthetic sunscreens to boost the Sun Protection Factor (SPF), thus reducing the risk of irritation or allergies attributed to excessive usage of chemical sunscreens. 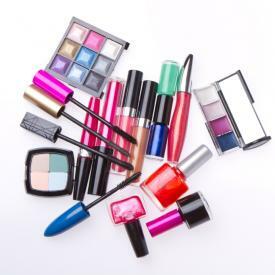 Titanium Dioxide is also used as used as an opacifying agent to give cosmetics a luxurious, transparent look and feel, and additionally functions as a colorant, providing a whitish hue to cosmetic preparations. It is widely used to provide flawless coverage, function as a base for pigments, and serve as a thickening agent. You can find this ingredient particularly in foundation, blush, bronzer, and moisturizers. It is also often used in lipstick and eye shadow formulations. Iron Oxides are naturally-occurring mineral deposits that are used as pigments in a variety of makeup applications. Generally safe for even the most sensitive skin, they are gentle, non-toxic, moisture-resistant, and tend to work fabulously in products that remain on the surface of skin. Because Iron Oxides typically come in shades of red, orange, black, or brown, they are used to add color to makeup products. They're impervious to moisture, smudge-resistant, and have true staying power and hold. Best yet, they create rich, intense pigments to deliver a seriously vibrant finish. Iron Oxides are found in a wide variety of makeup products, including natural and organic ones. This inorganic compound contributes color to foundation, powder, mascara, eyeliner, eye shadow, and lipstick. Mica is used as a texturizer and coloring agent in cosmetics. Mica is actually a group name for a series of silicate, ground minerals that have similar physical properties, but vary their chemical arrangements. It features a contrast of colors, from colorless to pale green, brown, or black. Safe and natural, this is the most common mineral found in makeup products. When ground up, the shimmery appearance gives a natural radiance and brings a subtle glow to any pigment. Mineral makeup is easy to wear, natural-looking, and luminous. It glides easily onto skin and creates a super smooth canvas for flawless makeup application. When mixed with other ingredients such as titanium dioxide and zinc oxide, it covers blemishes, blotches, and general imperfections. Because of the versatility of Mica's consistency, it works well in a variety of forms. Mica can be found and applied in loose powder form, pressed powder form, and even mixed with other agents to become a gel, oil, cream, or liquid. An emollient softens and smooths the skin. Many emollients are oils featuring an airtight action that provides a barrier against moisture loss. Dimethicone is a slippery form of silicone derived from sand. It's also described as a silicon-based polymer, meaning it's a large molecule made up of several smaller units bonded together. There are different grades of silicone, and cosmetics-grade silicones tend to create an elegant, silky, and spreadable texture in skincare products (what's not to love?). Non-comedogenic and FDA-approved, Dimethicone is a very desirable ingredient because it can deliver the active ingredients in the product and immediately smooth the look of imperfections. This highly advantageous ingredient is utilized in personal care products as anti-foaming agent, skin protectant, and skin conditioner. Generally speaking, it gives products that luxurious lubricity, slip, and good feel. It can also be used to help reduce the effect that some creams have on skin with immediate application. It soothes and protects against moisture loss when used in larger quantities, improves product flow and spreadability, and becomes an excellent waterproofing material for sunscreen emulsions. It also helps reduce the greasiness often found in high-SPF formulas yet allows skin to breathe. You can find Dimethicone in pretty much all makeup and skincare products, most prevalently in foundation, facial powder, eye shadow, and eye liner. Beeswax is a nutrient-rich animal wax secreted by bees that comes in the form of clear liquid. There are two grades available - yellow (which is natural) or bleached beeswax. The main elements are esters, which make up about 70 percent of beeswax, free wax acids, and hydrocarbons. Beeswax is completely non-toxic and non-allergic, does not clog pores, and has multiple skin benefits. It is anti-inflammatory, antibacterial, anti-allergenic, and a germicidal antioxidant. Beeswax is used primarily as thickener and emollient, but has also emulsifying properties, making it a great ingredient to include in cosmetic formulations. Beeswax is primarily known for its healing properties. It functions best when incorporated into water or oil emulsions, giving it an appeasing texture and consistency. An excellent emollient and support for moisturizers, beeswax protects the skin with its sunscreen action and water repellent properties. Beeswax has the ability to mix well with other ingredients and support their functions while providing permanence on skin and lips. Additionally, this ultra-nourishing ingredient locks in moisture and protects skin from environmental factors. All-in-all it features top-notch healing, softening, and antiseptic properties. There are different types of alcohol used in cosmetics for various reasons. SD Alcohol (specially denatured) evaporates quickly, leaving the active ingredients right on the skin's surface. Fatty alcohols are made from fatty acids and can be used as emollients, thickeners, or carrying agents for other ingredients. Other alcohols you will find in your everyday makeup products include Cetyl Alcohol, Stearyl Alcohol, Ceteareth 20, and Cetearyl Alcohol. Alcohol tends to attract and bind water to keep moisture in the skin, and can repel water to form a protective barrier on the skin. It delivers other powerful active ingredients into the skin and helps drives them deeper down, then transporting a bounty of benefits. Producing enhanced skin absorption, alcohol creates a less tacky texture in products and a more creamy consistency. It also helps to dissolve oil and tighten the appearance of pores, leaving skin looking smooth and youthful. The lightweight alcohols are known for their antiseptic, astringent, and fat and lipid solvent properties, while the heavier emollient alcohols are used for their occlusive and lubricating properties. Though some say alcohol can be drying to the skin, it is not harmful and definitely has more pros than cons. Thanks to its antiseptic qualities, alcohol is used as a natural and safe preservative in multiple cosmetic products. You will find a variety of alcohols including Alcohol Denat. in foundations, blushes, and bronzers. It's important to treat our skin the best that we possibly can. Another fundamental element when considering makeup products is knowing and fully understanding how cosmetics are made. If you're up to date on ingredients, quality, and their effect on the skin, as well as the science of makeup, you will most certainly be mindful when picking your beauty products.